The Irish Volunteers Commemorative Society hosted an exhibition and display to commemorate the 100th anniversary of the founding of the Irish Volunteers in Wynn's Hotel, Dublin, on September 28, 2013.
of the Irish Republic was presented to the manager of Wynns Hotel, and below are photos of this. some difficulty in taking good photos. However, we managed to get the photos below which show just some of those in attendance. There are many familiar faces among the attendees - historians & politicians. There was a fantastic range of artifacts on display and even the few hours we spent there was not enough to see everything in the detail we wished. badges, membership lists ... you name it, it was here. A highlight of this year's exhibition was the talk by renowned author and publisher Ray Bateson. Ray's new book "Memorials of the Easter Rising" has just been published (and was on sale at a 20 discount on the day). His talk was based on that book, and he illustrated it with several photos of memorials to the Irish Volunteers around the world. This was a fascinating talk that deserves a wider audience, and we hope Ray will 'take it on the road' in the near future. On November 16, 2013 the Irish Volunteer Commemoration Society held an exhibition in the Pillar Room of the Rotunda Hospital in Dublin, to mark the centenary of the founding of the Irish Volunteers. In the afternoon they attended a ceremony in the Garden of remembrance, organised this was by an Irish language group based in Dublin. 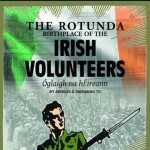 That evening in the Rotunda Aengus O Snodaigh TD launched his book “The Rotunda,Birthplace of the Irish Volunteers”.